The Los Angeles City Council approved a $50,000 reward in connection with the New Year’s Day fatal stabbing of 22-year-old Christian Nino in Cypress Park, and the killing last year of Victor Duenas, 25, who was gunned down on his front porch in El Sereno. Nino, 22, died after being stabbed once during a fight that was reported shortly after 2 am on Jan. 1 in the 2600 block of Jefferies Avenue, according to the LAPD. The suspects, described as male Latinos between 18- to 20-years of age, were seen running north on Jeffries and then eastbound on Avenue 28, police said. Detectives working on the case have not been able to identify a suspect or suspects in the killing. Duenas was standing on his porch around 7:35 p.m. Dec. 7 when an unidentified assailant walked up and opened fire, striking him in the back as he fled into his living room, according to the motion calling for the reward. The two $50k rewards are for information leading to the arrest of the person(s) responsible for this death. Anyone with information regarding Nino’s killing, should contact Detectives Martinez or Lenchuk, at Northeast Homicide, at (323) 561-3321. Person(s) with information in Duenas’ shooting death, are asked to call LAPD Hollenbeck detectives at (323) 342-8960. Anonymous tipsters can call Crime Stoppers at (800) 222-8477. The coroner’s office Monday released the name of a man who was stabbed to death in the Cypress Park area of Los Angeles. The victim was 22-year-old Christian Nino, said coroner’s Lt. Larry Dietz. The stabbing was reported at 2:18 a.m. Sunday 2627 Jeffries Ave., said Sgt. Teresa Anderson of the Los Angeles Police Department’s Northeast Station. He was pronounced dead at the scene, Anderson said. A gang member avoided a potential death sentence in pleading guilty Thursday to the 2008 murder of a man who was holding a toddler when he was gunned down in the Cypress Park area of Los Angeles and the killing of a cellmate three years later. Jose Angel Gomez, 27, will be sentenced Nov. 18 to two consecutive life prison terms without the possibility of parole. Gomez pleaded guilty to the Feb. 21, 2008, killing of Marco Salas, who was carrying his 2-year-old step-granddaughter when he was killed near Aragon Avenue Elementary School, along with the strangulation of Jonathan Najera in the Men’s Central Jail sometime between Feb. 28 and March 1, 2011. Gomez also admitted the special circumstance allegation that the killings were carried out while he was an active participant in a criminal street gang, and to further the activities of the gang. He had been awaiting trial next month in connection with Salas’ killing, along with the death of Daniel Leon, a gang member who was fatally wounded by police during a shootout soon after Salas’ shooting. The murder charge involving Leon’s death is expected to be dismissed as a result of his plea. Gomez had been awaiting trial separately in connection with the jail killing, in which several other inmates are also charged. Co-defendant Rafael Carrillo was convicted in December 2013 of first-degree murder for Salas’ killing, but was acquitted of murder involving Leon’s death. In January, a state appellate court panel rejected Carrillo’s contention that there were errors in his trial, and the California Supreme Court refused in April to review the case against him. Authorities today sought public help to find the driver of the first of two vehicles that struck and fatally injured a pedestrian in the Cypress Park area of Los Angeles. According to police, a woman in her 30s was struck by the two vehicles that were northbound on San Fernando Road near Loosmore Street as she crossed outside the marked crosswalk about 2:15 a.m. Thursday. The woman, whose name was withheld pending family notification, died at a hospital. The hit-and-run vehicle was described only as a white box truck. No description was released of the driver. Anyone with information on the case was urged to call the LAPD Central Traffic Division at (213) 833-3713, or (877) LAPD-247. A man was shot in the buttocks Saturday during an exchange of gunfire with another man in the Cypress Park area of Los Angeles, authorities said. The shootout happened at Avenue 27 and Idell Street at 2:15 p.m., according to Sgt. D. Bowler of the Los Angeles Police Department’s Northeast Station. “The shooting was one person against another and there were a bunch of casings,” Bowler said. The victim was not cooperating with police and the incident may be gang related, he said. Grief counselors were on hand Monday at Sotomayor Learning Academies, where students returned to class following the weekend deaths of two classmates whose bodies were recovered from the Los Angeles River near Cypress Park. 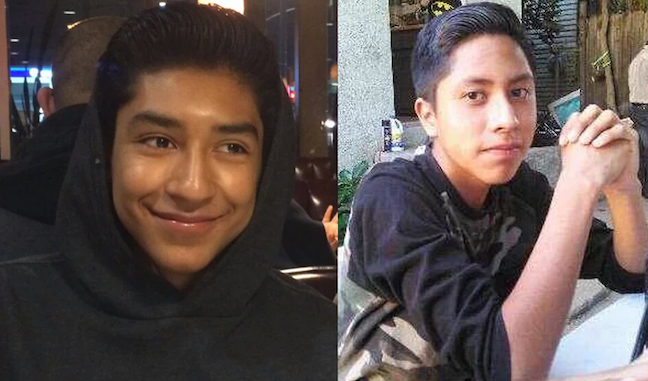 The coroner’s office identified the boys as Carlos Jovel, 16, and Gustavo Ramirez, 15. Autopsies were pending. The teenagers went missing Friday, prompting a search of the area of Division Street and San Fernando Road. The two teens were in a group of four people who went to the river after school. One fell into the water and another is believed to have jumped in after him, witnesses said. At about 12:40 p.m. Sunday, firefighters and police responded to the river in the 1900 block of San Fernando Road, and police announced at 8:20 p.m. that divers had recovered two bodies. Los Angeles Unified School District Superintendent Michelle King said district officials are “deeply saddened by the drowning of two student” from Sotomayor, 2050 N. San Fernando Road. Terapeutas de duelo están presentes en la preparatoria Academias de Aprendizaje Sotomayor, donde los estudiantes regresaron a clase tras la muerte de dos compañeros de clase el fin de semana, cuyos cuerpos fueron recuperados del río de Los Ángeles cerca de Cypress Park. La oficina del forense identificó a los chicos como Carlos Jovel, 16, y Gustavo Ramírez, 15. Las autopsias están pendientes. La desaparición de los jóvenes el viernes provocó una búsqueda en la zona de División Street y San Fernando Road. Los dos adolescentes estaban en un grupo de cuatro personas que fueron al río después de la escuela. Uno cayó en el agua y otro se cree que saltó tras él, dijeron testigos. (Izq) Gustavo Ramírez, 15 y Carlos Jovel, 16. Alrededor de las 12:20pm del domingo, los bomberos y la policía comenzaron la búsqueda en el río en el 1900 bloque de San Fernando Road, y anunciaron a las 8:20pm que los buzos habían recuperado dos cuerpos. La superintendente del Distrito Escolar Unificado de Los Ángeles Michelle King dijo que los funcionarios del distrito están “profundamente entristecidos por el ahogamiento de dos estudiantes” de la escuela Sotomayor, localizada en 2050 N. San Fernando Road. “En nombre del distrito, expreso mis más profundas condolencias a las familias y amigos de los chicos y a la comunidad de Academias de Aprendizaje Sotomayor, dijo King. “Consejeros de crisis del Distrito y consejeros escolares están disponibles en el campus para proporcionar apoyo a los estudiantes y el personal afectados por esta tragedia”. The coroner’s office confirmed Monday morning two bodies recovered from the Los Angeles River near Cypress Park were those of the teenage boys who went missing in the area. The victims were confirmed to be Carlos Jovel, 16, and Gustavo Ramirez, 15, said coroner’s Lt. Larry Dietz. Autopsies were pending. Both of the victims were students at the Sotomayor Learning Academy, located near the river where the bodies were found. 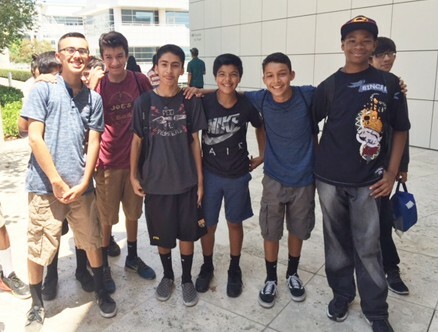 The teenagers went missing on Friday and crews were searching in the area of Division Street and San Fernando Road. The two teens were in a group of four people. One fell into the water and another went in after him, according to news reports. An initial search of the river Saturday was unsuccessful. of San Fernando Road. Los Angeles police tweeted about 8:20 p.m. that divers had recovered two bodies. Family members initially were unaware the boys had gone in the water, according to news reports. The mother of a young man killed last year after he fell from a bridge and onto the Pasadena (110) Freeway, where he was hit by a car, is suing the state, the city of Los Angeles and the owners of the vehicle, alleging their negligence all contributed to the death. Eva Alicia Zatarian, the mother of 22-year-old Armando Sahagun of Highland Park, filed the lawsuit April 14 in Los Angeles Superior Court. The decedent’s son, Matthew Mondo Sahagun-Zendejas, was 2 years old when his father died. The boy also is a plaintiff and his interests are represented by his mother, Kimberly Zendejas.The suit seeks unspecified damages. Sahagun fell off the Pasadena Avenue Bridge and onto the freeway in Cypress Park at about 7:45 p.m. last July 18, according to the Los Angeles Police Department. He was then struck by a car owned by Saul Morales and Yessica Feria and driven at the time by Morales, the suit states. Morales, who was traumatized by the incident, stopped and called police, the LAPD said previously. The suit alleges that the state and city are liable because the bridge lacked state-of-the-art traffic engineering safety measures that could have reduced hazards confronting pedestrians. The complaint provides no specifics other than to say there was inadequate lighting. The alleged deficiencies could have been detected with regular inspections, according to the complaint. The suit further alleges that Morales was driving negligently when his car struck Sahagun, who worked at Dodger Stadium.